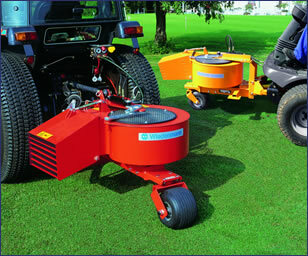 Wiedenmann have been providing ground care machinery for more than 20 years. With an ever increasing range of machines Wiedenmann offer innovative and specialist machinery for the care and maintenance of golf courses, municipal parks, recreational areas and sports grounds. Wiedenmann products promise high quality, reliability and durability as standard. Ernest Doe offers full parts, repair and service support for Wiedenmann products. Specialist design makes for high performance aeration on golf courses, sports grounds recreational areas and municipal parks. Gives deep spiking and aeration, a pre-requisite for healthy root growth. Specifically designed for constant daily use. Extremely robust yet remarkably low on noise emission, it offers excellent cutting performance. Available in three widths – 1.3m, 1.5m and 1.8m. Deck comes either side or rear discharge. Fitted with PTO clutch, linkage pins, rear roller with scraper bar and first set of 20mm diameter tines. Fit Efficient blower producing 200 cu m/min at 50m/second whilst keeping noise to a minimum. The design incorporates a 180 degree hydraulic swivelling blower unit making the unit very versatile. Parking stand and rear support wheel are standard. As professional groundcare machinery dealers, we support all the machines we sell through servicing and repairs in well- equipped workshops and through a professional, comprehensive parts supply service.